Our NBN street cabinet, or Node in FTTN. The pic is not crooked, the cabinet is out of level. We received advice that NBN access is now available in our street… about 10 months after the street cabinet was installed. This is the best hope we have had of escaping Telstra’s appalling service that we have endured for 6 years. 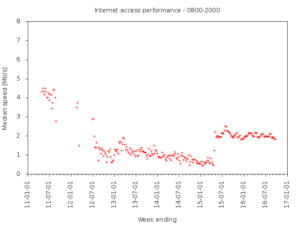 Above is a plot of the median download speed of the Telstra 8Mb/s ADSL service. 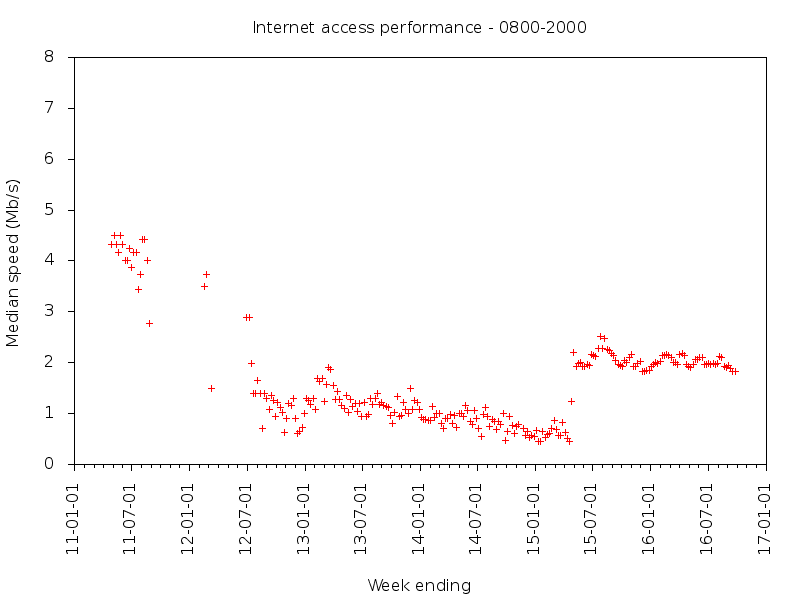 Above, the distribution for last week show that although HTTP speeds would appear to be capped at 2Mb/s on an 8Mb/s access pipe, the inevitable slide to poorer performance is shown where around 10% of the measurements are below 0.25Mb/s. We have signed up for a 12Mb/s service from iinet (one of 144 retailers using NBN access though only 86 are on the list from NBN for our use), and after some issues, there is an appearance that the service may be turned up next Wednesday. 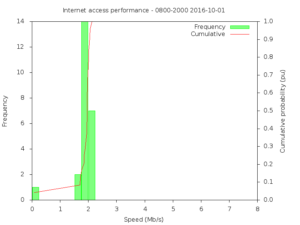 12Mb/s is the second highest of two speed options to us from iinet under the NBN FTTN architecture (12 and 25Mb/s… forget about 100Mb/s, that is simply a Prime Minister’s fanciful dreams). The government competition regulator ACCC has recently started consultation with the industry of the meaning of speed, so their days of saying one thing and deliver a small fraction of it might be limited. So far industry has responded saying that they think self regulation is the answer… really. 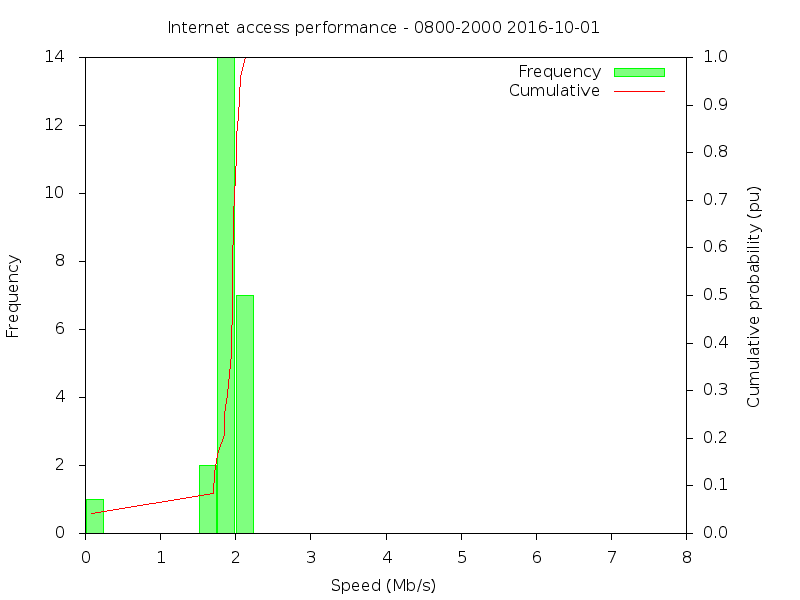 The new broadband modem / router arrived, and I have attempted to configure it for our network so that when the new service is cutover, we have solved most of the issues. I wasted about four hours trying to so a fairly basic set of configuration changes, and finding that a factory reset was necessary to again find the modem. Eventually I isolated the problem, the router’s IP address (10.1.1.0) could not be changed in any way without disrupting the thing. Confusing this task was a continuing stream of requests to the browser to display URLs beginning http://dsldevice.lan/ which gave http errors… the pages (which should have been on the router) did not exist, and some external pages that could not be accessed stand alone and looked potentially malicious. Some of this was traced to VOIP notifications even though VOIP was turned off. Searching for firmware updates, I find the new modem is shipped with firmware that is about four years old and has at least three updates since. Applying the latest and trying the same configuration I started with and it played ball straight away. 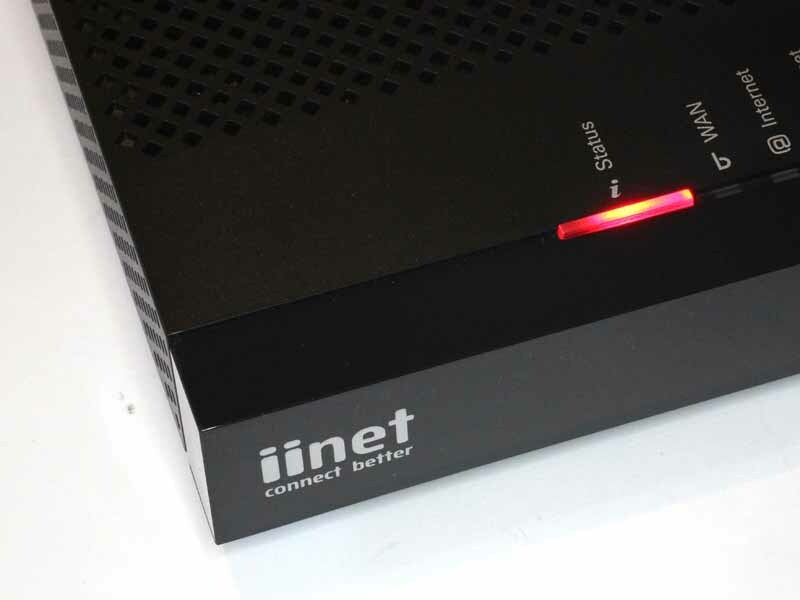 Nice one iinet, shipping stale buggy firmware in new product to a new customer… so much for their slogan “connect better”. I have configured literally hundreds of modem / routers in my career, and this Technicolor TGiinet-1 is unequivocally the worst. The next problem to solve is visibility of the LEDs, they are embedded in the top of the box and cannot be seen if viewed below the plane of the top of the box. Now it seems impossible to find any kind of statement that commits NBN to anything… signs of lawyers in control of the enterprise.Of course we are not in contract with NBN so it is unlikely that any of NBN’s promises or statements are enforceable. It is a clever architecture conceived by a government owned enterprise guided by governments of the day. I wanted to establish if the node in FTTN is battery backed, and if so, its endurance. No such luck… but I did find pictures that members of the public have taken of these cabinets when the doors were open, and there were clearly batteries in the bottom deck. As to whether they all have batteries, and their endurance… that is anyones guess it would seem. So, in the hope that my node does have battery and that it has a worthwhile endurance, I am considering battery backed power for the modem / router. Though it is rated for 12VDC @ 2A, it only consumes 0.35A with VSDL disconnected and telphony disabled. There is a prospect that average current in service might be under 0.5A, and that a 7Ah gel cell might power it for 12h or more. If that turns out to be true, I will purchase and install a battery backed supply using a 7Ah gel cell (~$150) for the improved reliability. That said, the existing Telstra node has had more power failures resulting in flat batteries that interrupted Internet and phone service here for days than loss of power to our own premises. 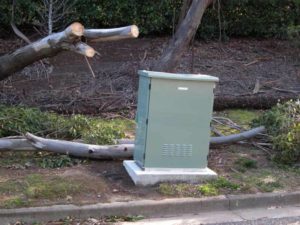 There is a risk that NBN’s maintenance policies might be no better.